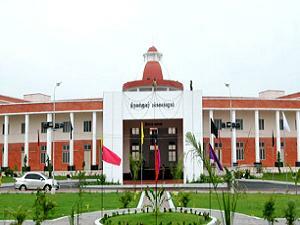 Thiruvalluvar University, Vellore invites applications for various Postgraduate courses commencing in the session 2012-13. Candidates should have a Bachelor's degree in relevant discipline from a recognised university. Candidates should have a Master's degree in relevant discipline with 50% of marks from a recognized university. Application Forms and Prospectus can be downloaded from the official website of Thiruvallavar University. For M.A and M.Sc: The filled application form along with DD of RS. 200/- (Rs. 100/- for SC/ST) in favor of 'The registrar, Thiruvalluvar University", payable at Vellore. The cost of the application form for Ph.D is Rs. 500/- and for M.Phil Rs. 200/- (Rs. 100/- for SC/ST). Last date for the submission of filled applications is within 10 days from the date of publication of university results. Last date for the submission of application form for M.Phil is Aug 30, 2012.